It's that time again and the third year will be bigger and better than ever! 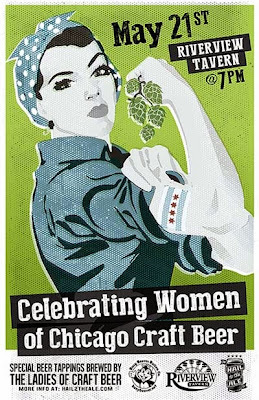 We'll be taking over all 26 taps at Riverview Tavern to represent our local ladies. Numerous female brewed collaborations and special firkins will be tapped as well with proceeds benefiting the local chapter of Dress For Success. Women from some of your favorite Chicagoland breweries will be in attendance, including Temperance, Rock Bottom Chicago, Begyle, Metropolitan, DryHop, Goose Island, Revolution and Two Brothers. Newcomers to the scene this year: Rude Hippo, Motor Row, Forbidden Root, Lagunitas and Church Street.